GLUE is a universal resource for the growth and development of EMPOWERment paradigms. This program is certain to develop strong leaders in all ranks of your organization. The “GLUE Guys” touch on vital issues that reaffirm the connections to the communities and people we serve. Their unique brand of leadership empowerment brings focus on the individual leader and their growth through principled leadership! I have been following the G.L.U.E. Guys for quite some time now. Their innovative approach to leadership development has the all-access flavor that is necessary in today’s business market. Although I have primarily seen their work in the emergency management sector, I recognize those foundational principles that are the hallmark of successful leaders and organizations. Listen in on Monday, June 18, 2018 at 6:30 PM CST/ 7:30 PM EST. Leadership Development Concepts, LLC is dedicated to improving lives through personal development and building a path to personal leadership. While attending a community event in the City of New Haven, Hartford Fire Chief Reggie Freeman and I got the opportunity to “chop it up” and discuss his passion with Transformational Leadership. Chief Freeman’s approach to management is crisp and to the point. He has the innate ability to inspire and encourage leaders. Please give a listen and share this great insight that Chief Freeman has been espousing all over the globe. On February 1, 2016, Reginald D. Freeman was sworn in as the 37th Fire Chief/Emergency Management Director for the City of Hartford. Prior to the City of Hartford, Chief Freeman served as Fire Chief for Lockheed Martin Aeronautics in Ft. Worth, TX also known as U.S. Air Force Plant 4. In addition to his duties as Chief of Department to the team in Ft. Worth, Chief Freeman provided international guidance and direction to the Italian and Japanese governments through the Ministry of Defence by providing training and consulting to each nation’s Air Force Fire Department personnel, respectively as it pertains to the F-35 Lightning. Furthermore, Chief Freeman served as the Assistant Chief/Deputy Director of Emergency Management for the City of Hartford, CT as well as Fire Chief for Lockheed Martin in Marietta, GA. (U.S. Air Force Plant 6) where he was named Professional of the Year in 2009. Chief Freeman served in Iraq as a civilian Fire Chief for the U.S. Department of Defense and coalition allies from 2004 to 2008, providing all hazards fire and emergency services to forward and continuing operating bases throughout Iraq. His last assignment was at their headquarters on Camp Victory in Baghdad as the Chief of Compliance, Safety, & Planning where he helped managed more than 700 firefighters and nearly 25,000 calls per year. He has worked in a number of fire service capacities in his career including Firefighter/Emergency Medical Technician (EMT), Fire Captain, Fire Service Instructor, Assistant Fire Chief, and Fire Chief. Chief Freeman’s educational accomplishments include a Bachelor of Arts in Leadership from Bellevue University in Bellevue, NE. He earned his Master’s Degree in Executive Fire Service Leadership from Grand Canyon University in Phoenix, AZ and he is currently a Doctoral student in dissertation phase studying Organizational Leadership with an emphasis in Organizational Development. Chief Freeman is also a graduate and Fellow of Harvard University’s Senior Executives for State & Local Government program at the Kennedy School of Government. Chief Freeman previously served as the Chair of the Industrial Fire & Life Safety Section for the International Association of Fire Chiefs (IAFC) and a previous Board member of the Executive Fire Officer Section of the IAFC and Technical Committee member of NFPA 1021 (Fire Officer Professional Qualifications), respectively. Additionally, Chief Freeman serves as the Chair for the Commission on Professional Credentialing via the Center for Public Safety Excellence, Inc. and is also the Director of Training for the Caribbean Association of Fire Chiefs. Lastly, Chief Freeman is an accredited Chief Fire Officer (CFO) through the Center for Public Safety Excellence, Inc. as well as a credentialed “Fellow” with the Institution of Fire Engineers, USA Branch. Lastly, Chief Freeman serves on the Board of Directors for NFPA. Chief Freeman is an Adjunct Professor for Anna Maria College and the University of Florida where he lectures in both undergraduate and graduate Fire Science and Master of Public Administration programs. Thank you to Connecticut State Representatives Pat Boyd and Brian Ohler for your Co-Leadership of the CT Fire-EMS Caucus. Your valued support for the safety, operations and well-being of First Responders in the State of Connecticut has not gone unnoticed. We had the chance to testify at the State Capitol to solicit support for the proper funding of the Regional Fire Schools. Special thanx and shout out to the Connecticut State Fire and EMS Caucus for granting time to hear the concerns for adequate funding of the regional fire schools. The Caucus was fully supported by the CT Career Fire Chiefs, the IAFF and our surrounding partners in Public Safety. Monday, April 23, 2018, 1:30 P.M. – 5:30 P.M. Whether in a large department or a small, we all experience the same issues around officer development. This workshop draws on several disciplines to aid participants in identifying the key characteristics of successful officers and managers. Through discussion and activities, the participants will be introduced to seven traits critical to professional growth. Among the issues covered will be barriers that hinder cultural change, transforming from firefighter to fire officer and shaping the future. Through the use of dialogue we will share the traits that are commonly associated with good officers and successful leaders. Drawing on elements of the National Fire Academy course, ” Shaping the Future”, participants will exchange ideas and insight for the past, current and future Fire and Emergency Services Culture. We will identify the elements of change in a non-judgmental way. Define the seven areas for exploration and discussion. Utilize dialogue and written exercises to identify key terms. Discuss barriers that hinder cultural change. 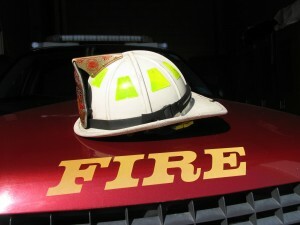 Identify resources to aid in transformation from Fire Fighter to Fire Officer. Identify unique issues and operations in the Fire Service Culture. Discuss common business and management cultural principles. Hope you can make it out and join me. The best lessons are always shared. Stay safe! From military service to public service, women have led the way. In this segment, a window into the life of Virginia Hall, the Maryland woman who helped the U.S. win World War II. And, we talk to some of the first women to join the ranks of the Baltimore City Fire Department. How do you improve on improvement? How do you make improvement part of an on-going process? This short clip is a session wrap up. It concludes with the theory of “Kaizen”; small incremental changes towards the greater good. Utilizing input from all areas. Being Chief has nothing to do with your title. It has everything to do with your choices—those that bring out your best and the best in people around you. Anyone can be Chief. Rick Miller is a confidant, author, and speaker who can help you unlock your potential and the potential of everyone in your organization. He has a track record of working with Chiefs of all levels doing just that. Great message by Rick Miller who gets it. One of my firefighters sent this link to me and said that it reminded her of me, in some ways. I am honored and wanted to share this link with others. So many people have the title Chief and that’s all that they have. I hope that I embody and represent some of the traits that Rick speaks of. I joined the Fire Smoke Coalition years ago. It was not until I got their information at FDIC (www.fdic.com) and reviewed it that I found a wealth of resources that can change firefighters lives. The mission of the Fire Smoke Coalition is to focus the required attention and resources on the deadly and life-long consequences of breathing fire smoke by teaching firefighters and first responders how to Prevent, Protect, Detect, Diagnose, and appropriately Treat the exposure if it occurs. The Coalition is comprised of firefighters and the medical community – all who embrace the challenge of teaching firefighters how to stay alive – and prevent the disease, illness and death associated with today’s deadly fire smoke. This post links you to an interview I had with the organizations Executive Director, Shawn Longerich. Her candor and passion for firefighter safety permeates this discussion. Please visit: www.firesmoke.org for further information and resources. Support the cause that is focused on firefighter safety and health. We can do better! It is always great to talk to Fire Fighters and Fire Officers, no matter where in the world I find myself. It was one of the tremendous highlights from my recent trip to South Africa. 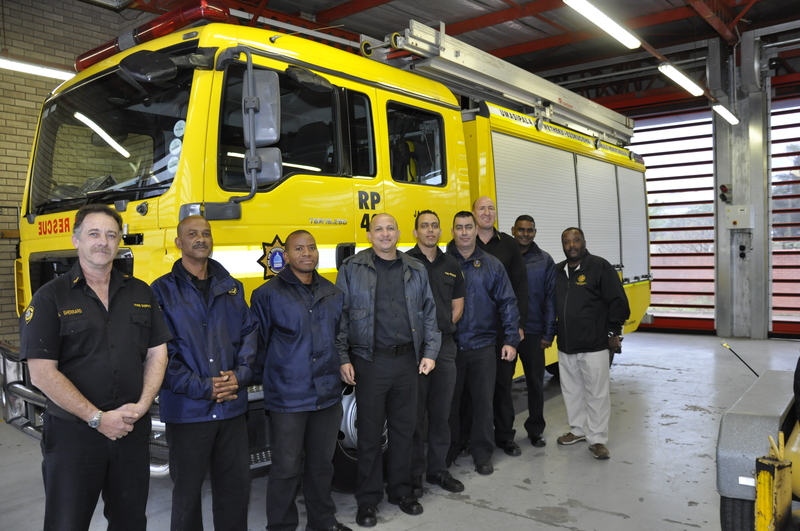 Thanks to the fire fighters of Johannesburg and Durban for sharing keen insights into their departments and operations. It was a great exchange. There are so many similarities to Fire Fighters and Fire Stations all over the world that they are too numerous to mention (including the mop bucket, lol). Got to see their equipment and discuss issues. Many of the same things that we struggle with in the USA are there as well. Pre- and Post- Apartheid Firefighter selection, staffing and training mirror some of the departments in the USA. I say that in terms of our own attempts at equal opportunity employment, post the Civil Rights era. A different scale and yet the same issues. We were able to discuss Officer selection and development; strategies and tactics; the attitude of the population, as it relates to Public Safety; and the future of department goals and objectives. 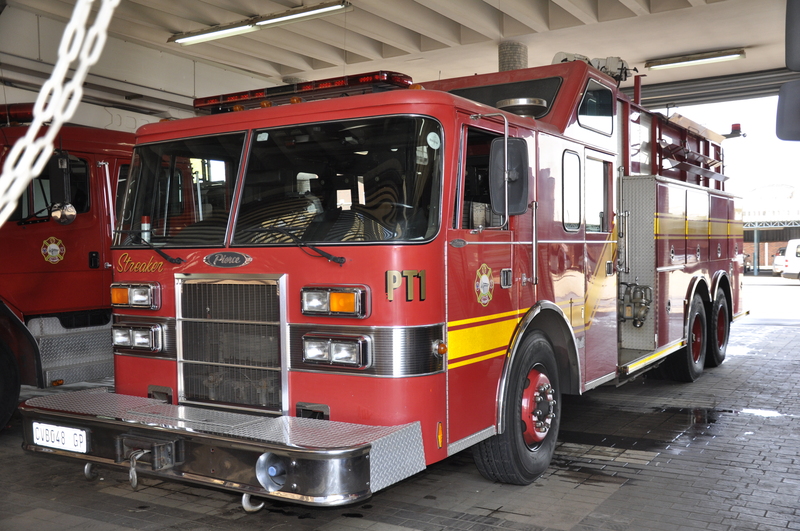 I felt right at home with this Pierce Attack Pumper, until I climbed into the cab and realized that the steering wheel was on the “wrong side” and that I had to do my pump calculations in the metric system. The “Rule of Thumb” still applies. It was nice to tour the city in the Operations Vehicle (equivalent to my Battalion Chief’s SUV, at home). The only difference is that theirs is a Mercedes SUV. 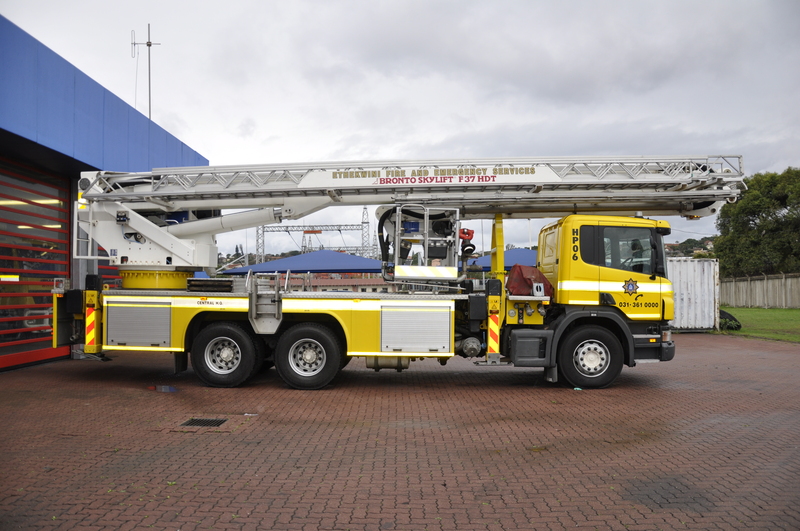 It was then on to one of the Ladder Trucks. The equipment was great to review and compare, yet we all agreed that the equipment is nothing and ineffective without proper human resource management. 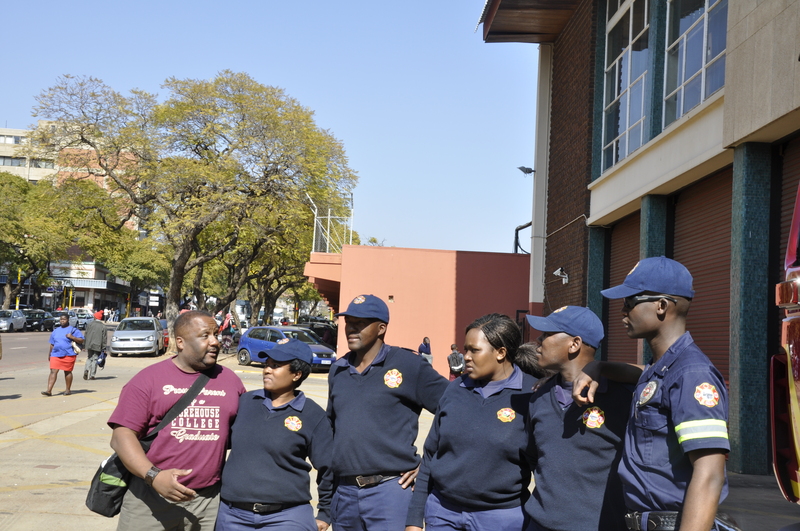 I want to thank Thato and Trevor for a great time with the South African Fire and Emergency Services Division. Stay safe and hope to chat again soon. You’ve done the unthinkable and are wondering if there’s any saving your career; there might be if you do these three things.